Last evening, we shut off the air conditioning and opened windows. I love real air and I slept very well. The humidity has remained low so we’ve enjoyed 24 hours of fresh air. Sweet Baby Rue spent the night out. He loves the cool breezes on his fur. And what did he do all day? 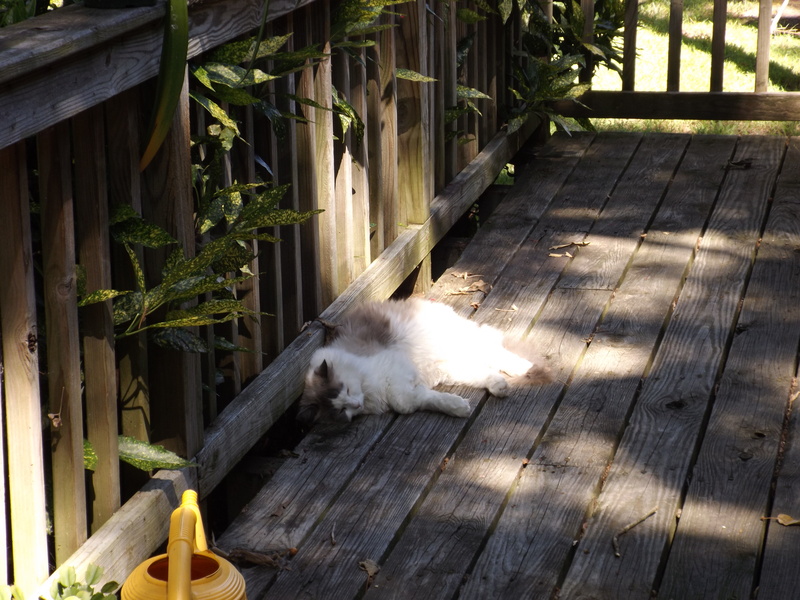 He got to sleep all day on the porch. He was a happy boy. I think I m going to get good use from this sweater. Even though it is too hot, I tried it on. And, it’s just right! You’d think that after all the years that I have been knitting, I’d have the confidence that should go with those years. But, I don’t. I still agonize over every thing I make. Is this good or bad? Many times, I have taken things apart and re-worked them. 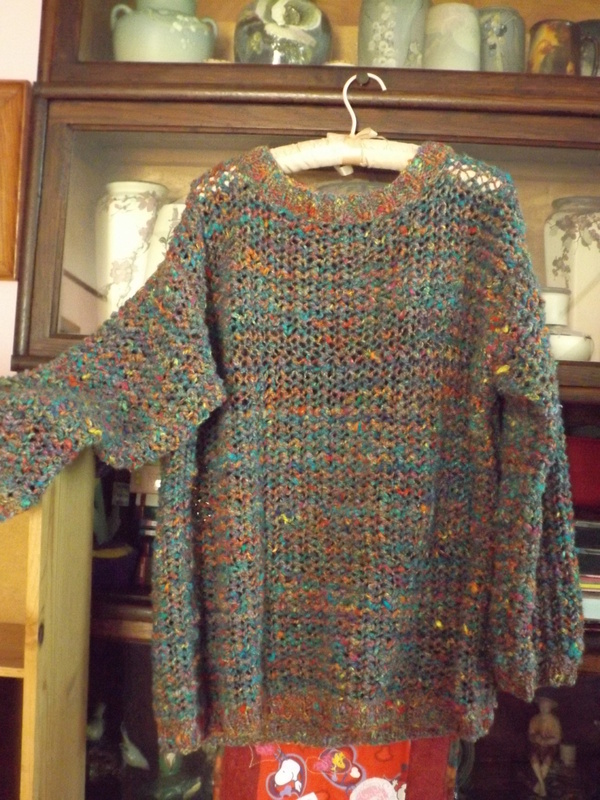 I have literally worn out both yarn and fabric with this craziness. For the most part, it’s been worth it. I usually finish what I begin. There are a few exceptions. I have a robe made from an old bedspread, a sweater and a vest. The sweater and vest will be completed ‘some day’. I’m still not certain about that robe. 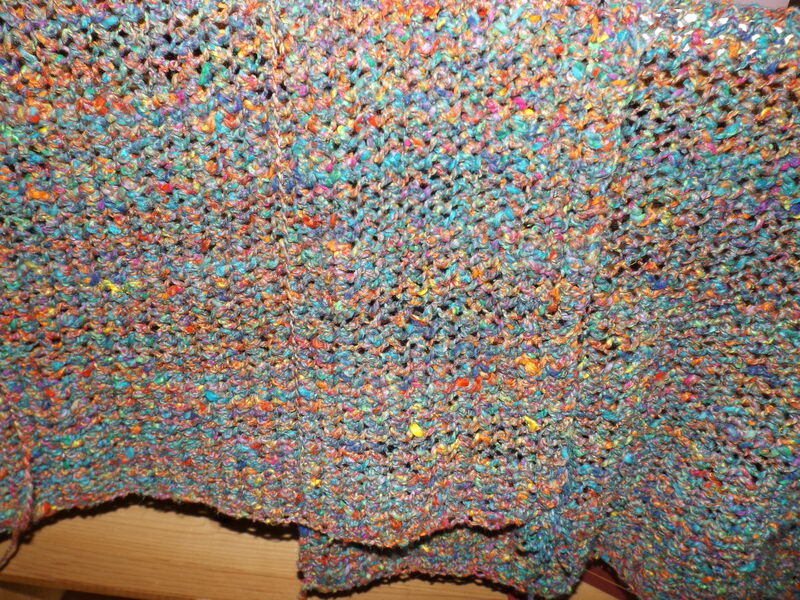 My sweater is almost finished. I weaved in most of the ends. One sleeve and side seam are finished. 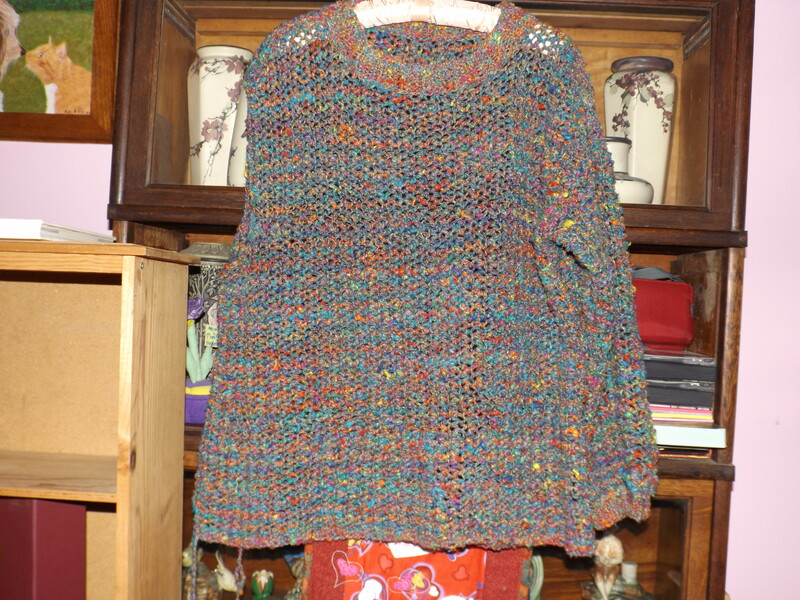 The neckband and sleeve cuff look like a different color, but they were made with one color rather than two like the rest. I only had five hanks of the blue and seven of the multi so I improvised. It’ll be nice on chilly days with the long sleeve tee or turtleneck. And, well, it’s been fun to knit. I was hanging up the last two skirts that needed fixing when I found another skirt that I was planning to shorten YEARS AGO. I think I put it back because it is going to be quite a pain. The hem is asymmetric and there’s embroider. I told myself that I didn’t like the waistband anyway. But, it has set-in pockets. So, now it’s hanging on the wall behind my sewing cabinet. It may be there a while.